Every year, Pedagogik: Jurnal Pendidikan publishes between 12 and 16 articles divided into two issues. 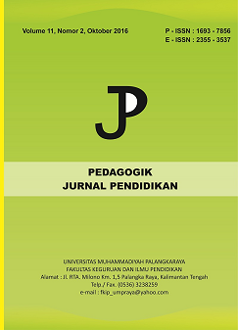 Starting from Volume 12 Number 2 June 2019 edition, Pedagogik: Jurnal Pendidikan makes changes to the template in the article that will be published. The change aims to make it easier for readers to observe important parts of each page of the article. The latest article format can be downloaded in the Templates section. The publication of Pedagogik: Jurnal Pendidikan certainly participates in disseminating the results of research and review of science and technology development conducted by lecturers and researchers especially from UM Palangkaraya and other universities. This edition contains 5 articles consisting of Education topics. Eksperimentasi Model Pembelajaran Kooperatif Tipe Student Teams Achievement Division (STAD) dan Tipe Jigsaw Pada Pokok Bahasan Statistika Ditinjau Dari Aktivitas Belajar Pada Siswa SMA. Experimentation of Cooperative Learning Model Student Teams Type Achievement Division (STAD) and Jigsaw Type in the Subject Statistics Viewed From Learning Activities in High School Students.